What is a computer network? Define its types. 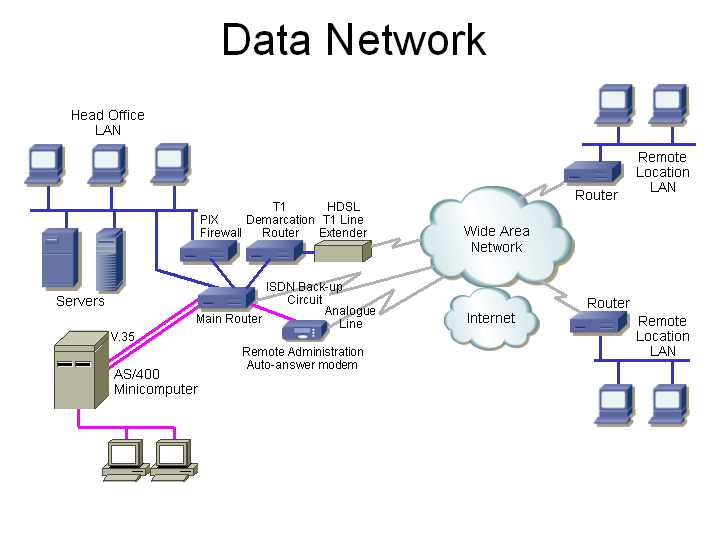 Computer network – A communication system provides the transfer or sharing of data and information between computers installed at different locations through connectivity is called computer network. In a computer network, a large number of computers are interconnected with each other, through one or more transmission paths. The type and structure of a computer network depends upon different parameter, according to the needs of users. Networking of a computer allows direct access to any other computer, anywhere and anytime, and one can transmit the information in any part of the world. Local Area Network (LAN) – A local area network is a small group of networks that interconnected together and located inside a single building, within the building of same organization or institution or within a limited area. All the terminals are connected with a main computer which is widely known as server. The server stores all sorts of data, programs, files and different software which provide them to the workstations. LAN system can have more than one server and supports a range of about 10km. Wide Area Network (WAN) – Wide Area Network (WAN) is used to connect a wider geographical area including different cities or even different countries. These communication links are established through telephone lines or microwave links via satellite. This type of network has made it possible to improve the working of business circles and other organizations. Wide Area Network has the capability of handling large database but involves higher costs. Metropolitan Area Network (MAN) – A metropolitan area network is used to connect different sites in the city and its nearby areas. Sites in these cities may be business houses, important offices, stock exchanges, head offices of big companies and many more. Depending upon the location of metropolitan cities, the network may be of LAN type or WAN type. Such networks are of great help to business houses in ascertaining their products sales at any moment. The information exchange regarding establishments of different offices, latest trend in share business can be readily and instantaneously known.